Is there anything more delightful than acquiring new yarn? Bringing into your life more color, texture, and planning what to do with it? My life as a knitting instructor takes me to incredible events with yarn markets that place so much potential in my path. Resistance is futile. Apparently at Stitches West I was in a mood for blues and greens (may as a response to all of the pink yarn I have been knitting). Personal knitting generally consists of adding to my wardrobe, and when I saw the tunic dress, Green Mountain Flyer, at the Green Mountain Spinnery booth, I was immediately drawn to it. Designed by Maureen Clark, this is a lovely garment that could be a staple of my wardrobe, comfortable and classic. But I worried about whether the wool would be too warm for the office. I tend to layer, these days! Fortunately, Green Mountain has many fiber options. I chose their Cotton comfort yarn, which is a 2-ply DK weight that is lighter weight. It is 20% organic cotton, 80% fine wool. The green/blue colorway spoke to me, being vibrant and calming at the same time. The Erin Lane bags that I picked out to carry my drop spindle supplies and Lucet projects also had similar colors. 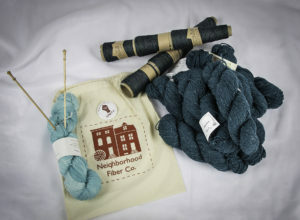 So did the Habu yarn that I bought at Madrona. I’m not sure what that yarn will be used for, but I am going to knit a swatch to see if it is suitable for a “Daily sweater“, from “Mason-Dixon: knitting outside the lines” I’ve knit this before in Rowan Calmer, in the sweatshirt weight that the pattern calls for. I think a lightweight version knit slightly over-sized might be really cool. We will see if I change my mind after swatching. So, it looks as though spring will be Green/Blue season for me!